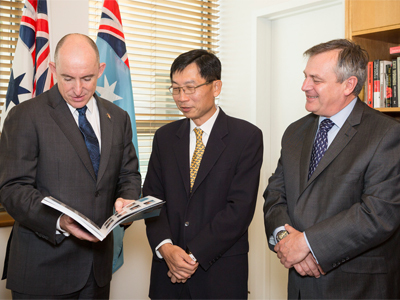 (L-R) Assistant Minister for Defence Stuart Robert, Mr Tan Peng Yam, the Chief Executive of Singapore’s Defence Science and Technology Agency and Chief Defence Scientist, Dr Alex Zelinsky at Parliament House, Canberra. Assistant Minister for Defence Stuart Robert today met with Mr Tan Peng Yam, the Chief Executive of Singapore’s Defence Science and Technology Agency, to discuss closer defence science and technology cooperation between Australia and Singapore. Increased cooperation is in line with the Australian and Singaporean Governments’ desire to enhance the relationship, including through deeper defence science and technology collaboration. Mr Robert welcomed Mr Tan to Australia and thanked him for his continued efforts to advance the relationship between Australia and Singapore on science and technology matters. “My meeting with Mr Tan today follows on from discussions with Singapore’s Minister for Defence Dr Ng Eng Hen last week at the Singapore Australia Joint Ministerial Committee meeting, and last November when we visited Singaporean Armed Forces training in Queensland,” Mr Robert said. Mr Tan is leading a Singaporean delegation attending a workshop on Systems Engineering and Integration organised by DSTO in Adelaide. “There are real benefits for both our countries in sharing knowledge, especially in systems engineering and integration—an area in which Singapore is considered a world leader,” Mr Robert said. Mr Robert and Mr Tan discussed opportunities to further strengthen defence science collaboration between Australia and Singapore. “Australia can learn from Singapore’s adoption of innovative technologies and how they readily partner with industry and universities to get enhanced capabilities into the hands of their war fighters as quickly as possible,” Mr Robert said. See the Australian Defence Image Library for photographs.